Vandelay Industries: Need a Good Lawyer? 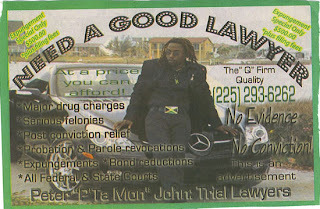 Not that your typical lawyer looks like Little John in front of his Mercedes brandishing a Jamacian belt buckle, but this lawyer is probably marketing to the right people he represents. Peter "P'Ta Mon" John Trial Lawyers is the "Q" Firm.